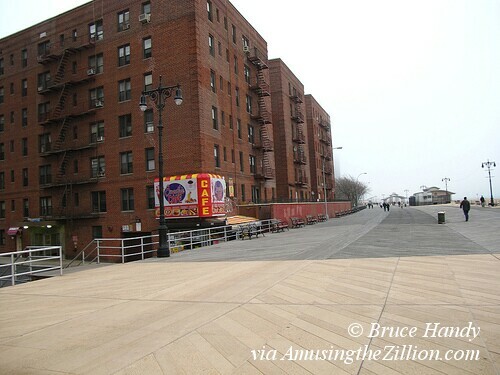 It’s a shame that part of the City’s Steeplechase property is set to become a residential enclave with million dollar views instead of additional acreage for Coney Island’s new amusement park. 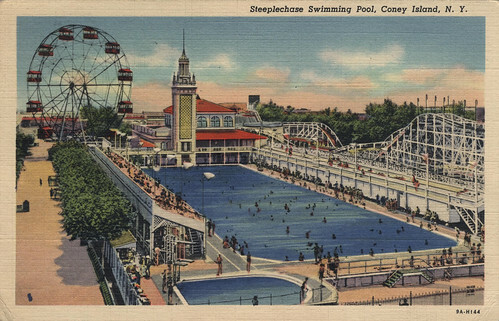 Over on the Coney Island Message Board, vintage photos and postcards of the salt water swimming pool at Coney Island’s Steeplechase Park (1897-1964) have inspired a lively discussion about the pool’s exact location. After several maps were posted, the consensus is the Steeplechase Park Pool is buried beneath Keyspan parking lot, which is City owned parkland. The fact that the Giuliani administration paved over Paradise–part of the Steeplechase Park site–to allow parkland to be turned into the Keyspan parking lot is bad enough (nod to Joni Mitchell’s “Big Yellow Taxi”). Now the Bloomberg administration is asking the state legislature to “alienate” and de-map the parkland/parking lot so it can be sold to a private developer (most likely Taconic Investment Partners) to build 1,900 units of housing. Somehow we don’t think a Steeplechase Pool in the basement will be one of the amenities of the luxury housing slated to be built on the site. 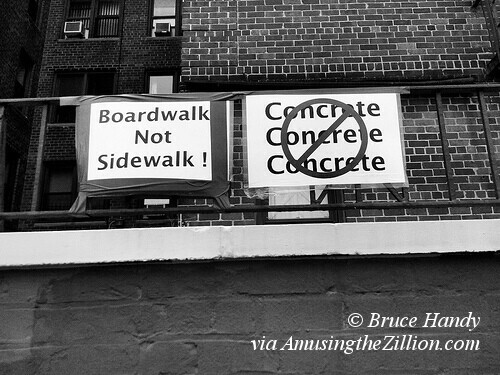 Perhaps the apartments will be named Steeplechase something-or-other in memory of George C Tilyou’s Funny Place, where 10,000 People Laughed at One Time? Steeplechase died in 1966, when Fred Trump bought the property and threw a party to celebrate the destruction of the Pavilion of Fun. “The Trump Organization office views the acreage as a potential site for a modern Miami Beach type high rise apartment,” according to the New York Times clipping “6 Bikinied Beauties Attend Demolishing of Coney Landmark” in Charles Denson’s Coney Island Lost and Found. Trump’s effort to get the zoning changed to residential failed to get approval. Now the City itself is planning to do what the City wouldn’t let Fred Trump do more than 40 years ago. 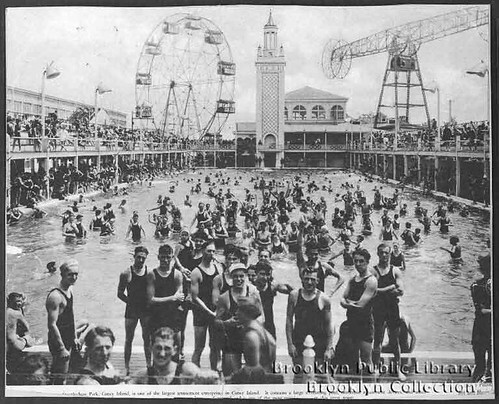 In Coney Island, Mayor Bloomberg gives with one hand (6.9 acres purchased from Thor Equities for the City’s new amusement park, which we applaud) and takes away with the other (City parkland aka Keyspan parking lot to be demapped by the state legislature and sold to a private developer to build housing including high rises). Before the rezoning in July 2009, the City estimated that over 1,900 of the proposed 5,000 housing units would go unbuilt if the parkland were not alienated. We wish those 1,900 units would go unbuilt and the parking lot remain parkland. As long as the land remains undeveloped and has the word “park” in it, there’s hope that it could be used for amusement or recreation in the future. Now that the City has gone ahead and acquired the Boardwalk property from Thor Equities to replace the de-mapped parkland/parking lot, we anticipate the legislators will give the plan the go ahead. Greetings from the Swimming Pool at Steeplechase Park! Brooklyn Public Library, Brooklyn Collection.